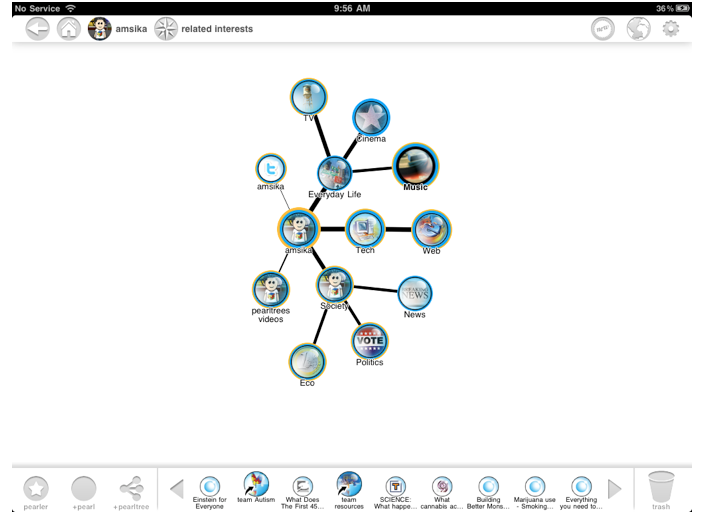 Content curation and mapping service Pearltrees is launching a dedicated iPad app today to allow users to cultivate and share their interests from the web on the tablet device. For background, Pearltrees is a visual social bookmarking service that allows users to organize, discover and share everything they like on the web. Content can be dragged and dropped into Pearltrees and the service will organize this via a string of ‘pearls,’ which can then be moved around, organized and shared. Launched in December 2009, Pearltrees has gathered more than 10 million pearls. The company has says it has been growing at average rate of 15% month over month, with over half a million visits in September. Considering the visual nature of the iPad, Pearltrees founder Patrice Lamothe says that the device is a natural home for Pearltrees. Via the apps, users can collect and retrrieve their favorite content from the web. The app also includes a real-time collaborative curation feature that let users spontaneously team-up with others on their favorite topics. And you can access the curation of Pearltrees’ community of over 200,000 active curators. Pearltrees faces competition from Pinterest.